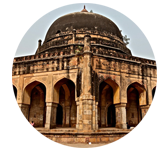 Jahanpanah was a protective city constructed by Muhammad bin Tughlaq to prevent the attacks made by Mongols. Jahanpanah means asylum of the World. The fortified city was destroyed at present, but some parts of the fort remain where the sightseers can visit the fort. This educational institution will help you to understand the rich historical culture and heritage of the fort along with the structures that are built inside the fort. You will also provide with the details about the best time to visit and with the details of how to reach the fortress. This tutorial is mainly intended for those individuals who are very much interested in acquiring the knowledge about the history of Jahanpanah Fort along with architecture design and interiors of the fort. This fort is tourist place and number of tourists all over the world visits the place every year. This is a precise tutorial meant only for informational purpose. There are no essentials as such. All that you got to have eagerness to investigate new places and experience their beauty. Jahanpanah Fort How To Reach?